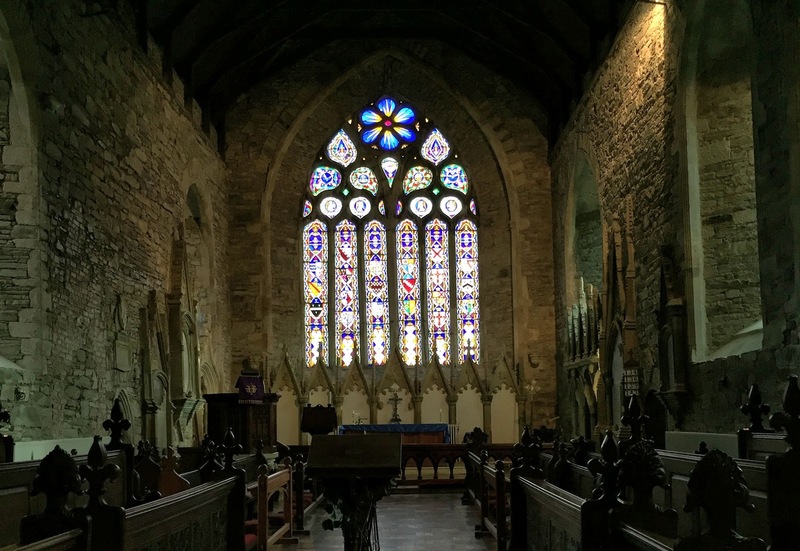 Day 10: Waterford to Cork. Feeling refreshed after a few days in Ireland's oldest city, we packed up and left Waterford just before 9 a.m. Driving southwest on the N25, we were surprised to see a brief hint of blue in the sky and thankful that for the moment our featherweight little SEAT Mii wasn't being battered by high winds. As its designation indicates, the N25 is a national primary road, part of a network of cross country routes connecting Irish cities. 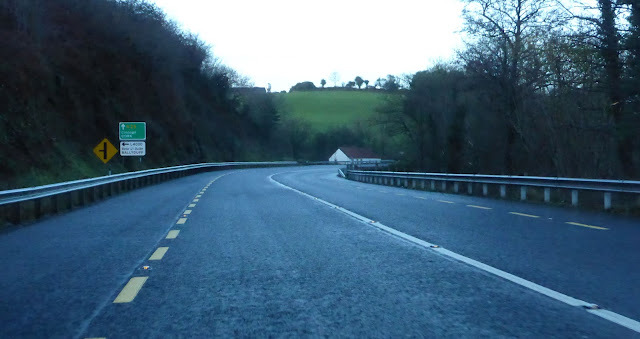 We were disappointed when the appealing four-lane dual carriageway style that characterizes the N25 through Waterford gave way to two lanes just south of the city limits. Past that point, the road was still a very well-maintained highway with generous 8-foot or wider shoulders on both edges of the road. 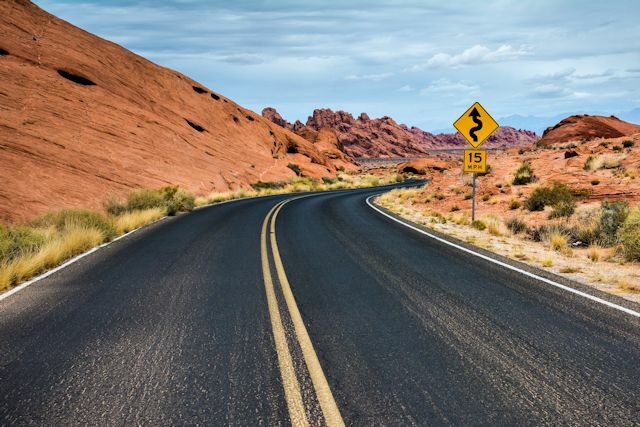 Periodically this extra space shifted into a passing lane in one direction or another. Before 10 a.m., we reached the coast with a view of the Irish Sea. When we stopped at a scenic overlook just past Dungarvan, a chill air greeted us as we stepped out of the car to check out the view. At 43°, the temperature on the coast was a good 12 degrees lower than when we left the inland city of Waterford. 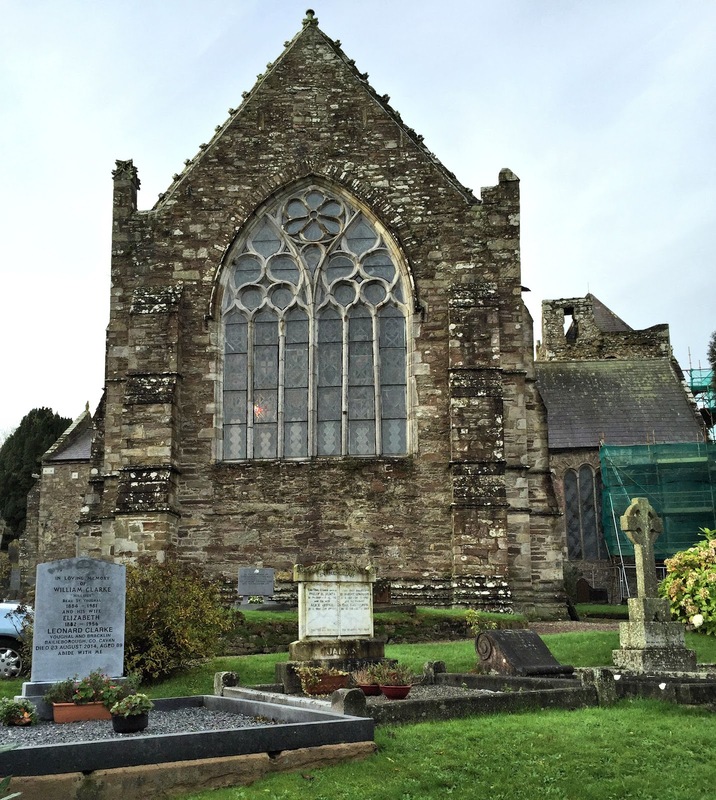 Continuing down the N25, we reached the medieval town of Youghal (yawl) on the coast. Though the foundation for a commercial seaport was first laid here by the Normans in 853, Youghal (pop. 6,745) was not incorporated until 1209. (Don't dates like this astound you?) 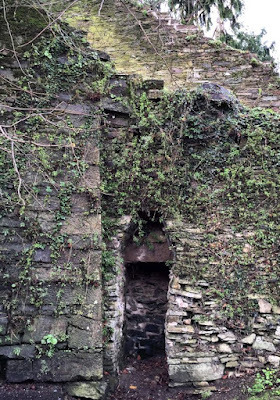 Over the course of its 1,200-year history, as y'all can imagine, Youghal has had many ups and downs. 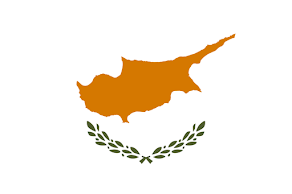 We heard about a few of them when we stopped in the Tourist Information office upon our arrival in town and met Sean, a very enthusiastic town ambassador who conducts walking tours of the town. In response to our inquiry about what we should see in the town as we were passing briefly through, Sean eagerly gave us a 20-minute history lesson and virtual tour of the town. After he loaded us down with the first three reams of brochures, we saw him pause for breath. Wasting no time, we grabbed the opening, darted out the door, and dashed to our car. Though we appreciated his energetic assistance, we didn't expect to spend more than hour in town and he had already given us more than enough to work with. St. Mary's Collegiate Church, Youghal - Where's the door? We headed off in search of St. Mary's Collegiate Church, an outgrowth of a monastic settlement established on the same spot around the year 450. The church was built there in 750 and expanded in 1220. As we were walking into the churchyard, we were befuddled about how to enter the building, not realizing that we had approached from the rear of the church. 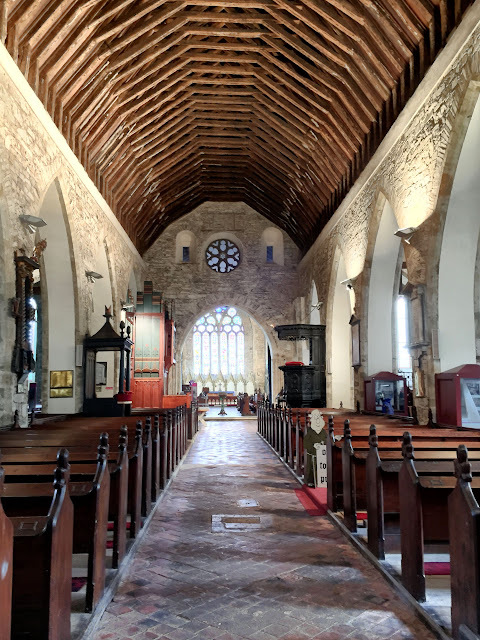 Patrick, a St. Mary's caretaker, was just arriving himself and offered some friendly guidance, pointing us to the entrance, ushering us inside, and offering a guided tour of what he described as the oldest church in continuous use as a house of worship in Ireland. 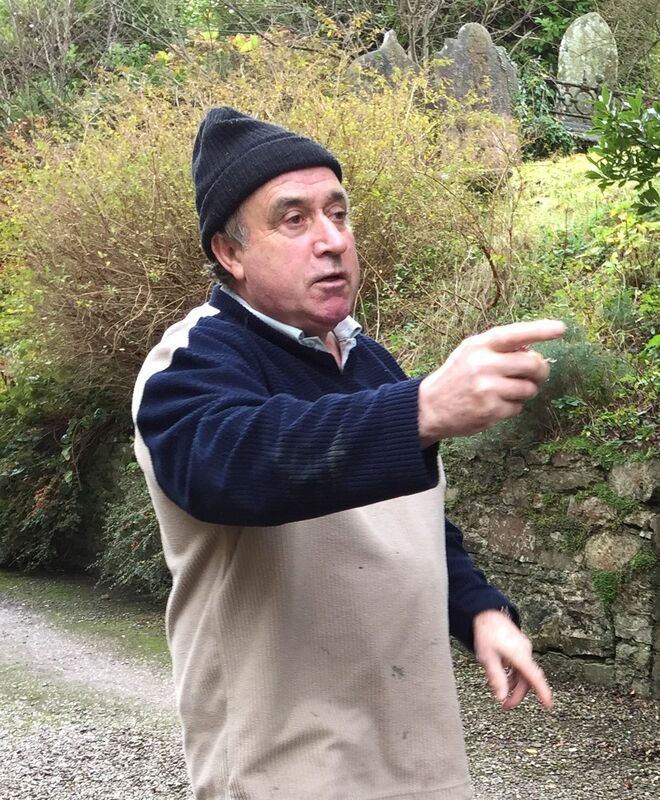 A native of Limerick, Patrick moved to Youghal 42 years ago and has clearly developed a passion for his adopted town. As we were leaving the church, he suggested we have a look at the surrounding burial grounds before we departed. Though most of the engravings on the soft stones were no longer readable, we did find an interesting spot. On the back wall of the burial ground is a coffin-shaped recess. At one time, an empty coffin would have been stored there in wait for pauper burials. A person who could not afford a coffin burial would have his body temporarily laid in this coffin to be ceremoniously carried to his grave. Then the corpse would be removed from the coffin and buried in a shroud, and the coffin returned to its niche to await the next funeral. Today there's no longer a coffin stored in this space. But there is another kind of box. It's a letterbox that we hid in this cozy nook. 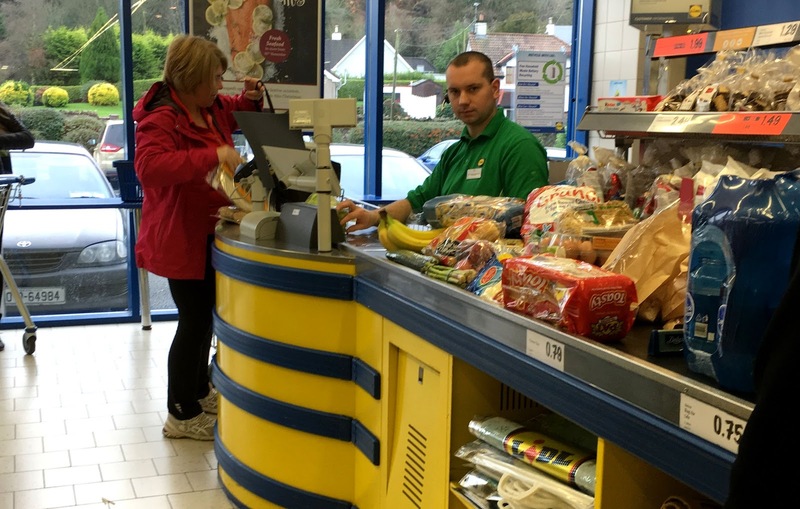 Before returning to the N25 toward Cork, we stopped at a local Lidl (rhymes with needle), a discount supermarket chain, and loaded up on supplies. Grocery shopping in another country is always so interesting. Like Aldi, Lidl stocks only the most popular items, offers little to no brand choices for any type of product, and sells their products at surprisingly low prices. As in many other countries we have visited, cashiers here do not bag your purchases, nor do they supply bags for you unless you purchase them. The items you're purchasing are scanned and handed back to you. It's up to you to figure out how to package them to get them home. A customer in front of us must have had more than 100 items in her cart. As they were scanned, she returned them to the cart. Then she paid her bill and walked out of the store with the full grocery cart. Wish we'd followed to see how she dealt with all those loose groceries in her car. Though it was almost 1:00, we had but an hour to reach Cork, so we figured we'd grab lunch when we arrived. Then once we drove to a hotel and obtained a room (for once we hadn't booked ahead), it was after 2:00. so we decided to drive to Blarney Castle and make a picnic with our supplies from Lidl. Except by the time we got to the castle, it was 3 p.m. and the blarney stone was calling our names. Lunch could wait. 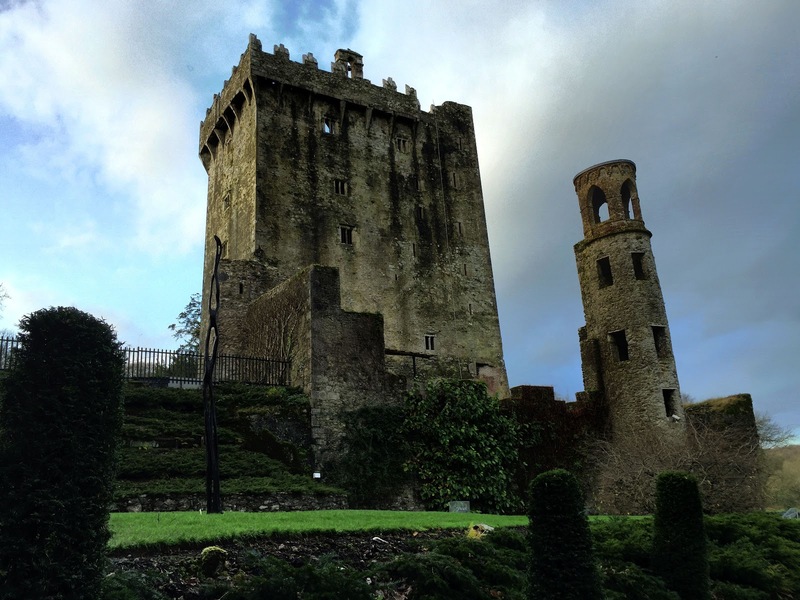 As we were to learn, the current Blarney Castle is the third structure to have been erected on this site. 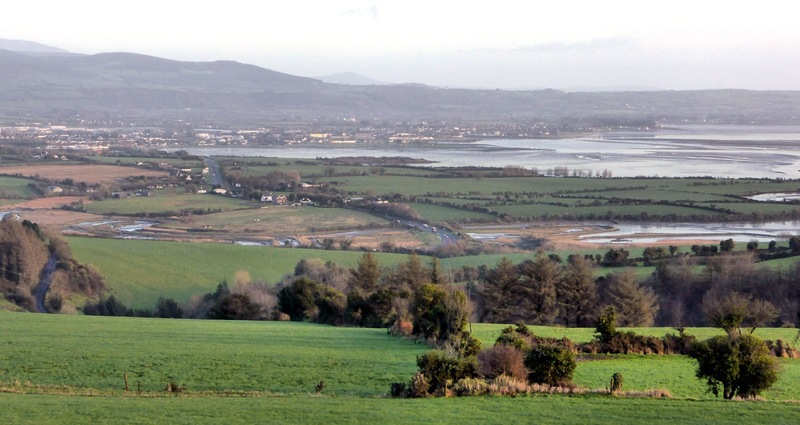 A wooden hunting lodge occupied the spot in the tenth century, replaced around 1210 by a stone structure, which itself was demolished for this third castle built by Cormac MacCarthy in 1446. 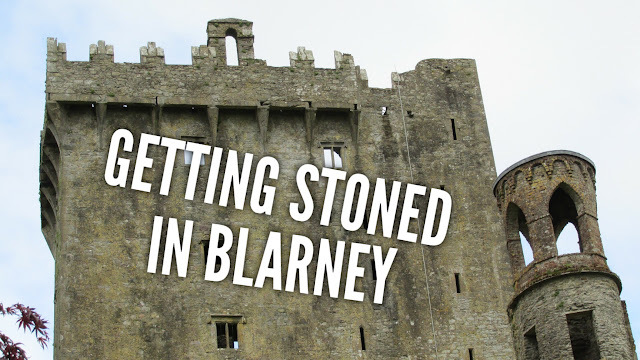 But everyone knows the real attraction of this spot is the so-called "blarney stone." 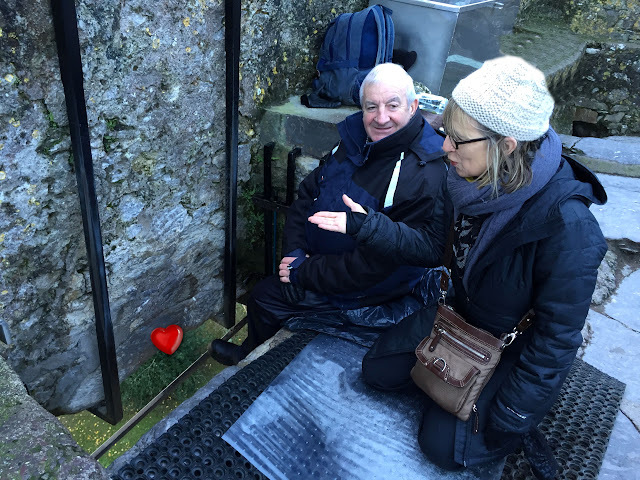 For more than 200 years, legends of people, including statesmen and screen stars as well as us ordinary mortals, have climbed up the 100 winding stone steps to kiss the blarney stone, said to endow those who pay it such homage with the gift of eloquence. Though its history is a subject of debate, what's certain is that the stone is a block of limestone built into the battlements at the top of Blarney Castle. Its position makes the act of kissing it a bit awkward. An attendant is on duty to ensure you position yourself properly and to support you as you go in for the kiss. To say it's a bit awkward is an understatement. But it wasn't so much the contortions needed as the thought of all the other lips that had left their mark (and who knows what else) on the stone before us. We were content to merely blow a kiss to the legendary rock. 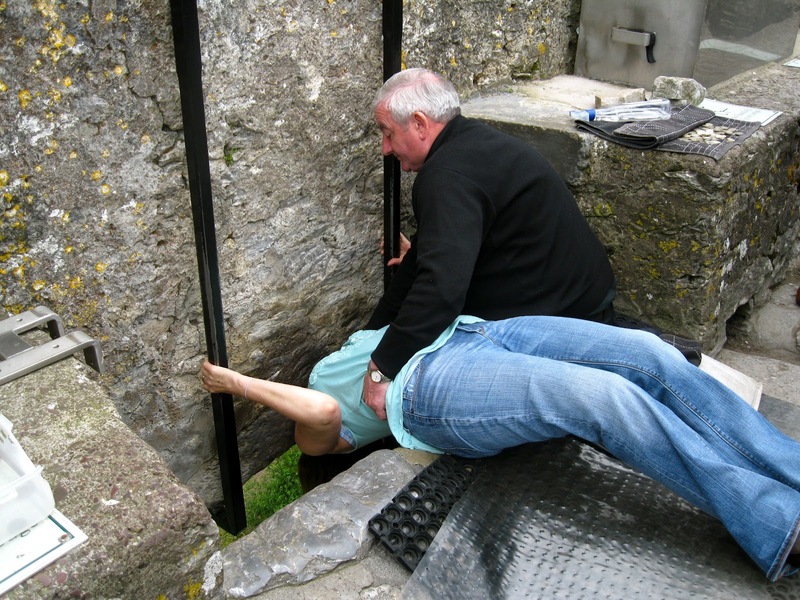 Dennis, the attendant, was quick to point out that this approach was rather popular with other squeamish visitors. It was after 4:00, and the sun was drifting toward the horizon by the time we left Blarney Castle, not exactly picnic conditions. Besides, the restaurant at our hotel would begin serving dinner at 5:00. So we made the logical choice, drove back to Cork, and had our last meal of the day. Tomorrow we'll drive south and explore the coast south of Cork. St. Mary's nave. Timbers have been carbon dated to 1140. 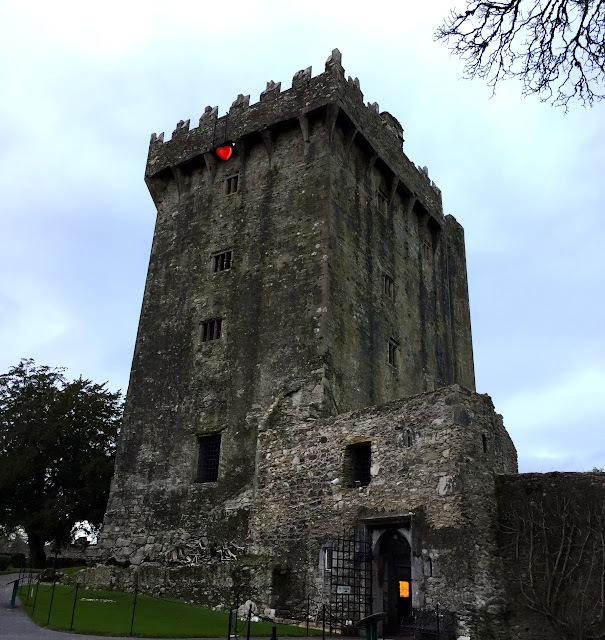 Heart (added) indicates location of blarney stone.